Champagne favors are a wedding favorite for guests. The time-honored tradition of celebrating with bubbly makes this type of favor a crowd pleaser. There are ways to add your own touch to this special favor. When it comes to planning your reception, every couple allows for several champagne toasts during the meal. What better way to thank your guests than by sending them home with their own bubbly for toasting at their next special occasion? You can choose the same kind of champagne that is being served at your reception. Pink or sparkling champagne is always a good choice as well. You can find favorite bottles from local wineries, especially if your wedding is a destination for a large number of guests. Korbel-A case of 24 retails for just under $100, making each bottle less than $6 a piece. Korbel offers bottles in three signature champagnes. Grand Wine Cellars-Order from their signature collection or get a custom etched single-serving bottles. Etching Expressions-Choose your label from one of their stock designs, or submit your own design. To keep costs down, consider getting miniature bottles, but printing the labels yourself. Large sized shipping labels made with a good quality printer can produce excellent results. Include a thematic element (such as cowboy boots, snowflakes, or hearts), or wedding clipart, like bells or doves. Have your names and the date printed, along with a short thank-you message at the bottle of the label. If you do not have a quality printing program, you can always order preprinted labels from a graphics design studio or wedding favor specialty store. Just because you are trying to cut costs does not mean that you are limited to miniature bottles. A large variety of discount champagnes are available in full size bottles. A local grocery or liquor store will often have a nice selection of champagnes available in a wide price range, anywhere from $5 to $20 and up. The clerk may also be able to help you select a variety that is pleasing to many palates. Check with your store early, as you may need to place a special large order. Regardless of the kind of champagne you choose, be sure to order some juice or sparkling water that is bottled for children and guests who do not drink. Having champagne wedding favors does not just limit you to the bubbly drinks. 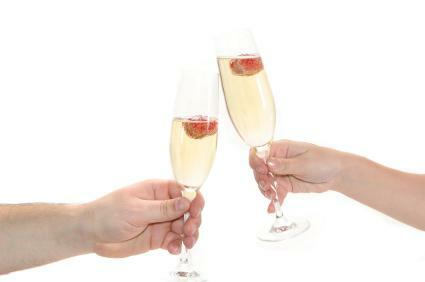 Numerous champagne themed items can be found to give out as a memento at your wedding. Personalized champagne flutes are a popular favor. While still champagne themed, they allow the guest to fill them with whatever spirit or drink she/he chooses. Your wedding date, names, or even a small design can be etched into the glass. Have them placed at each table setting before guests arrive. You can choose glass or even plastic, which makes for less breakage for children. If you enjoy cooking or have a bakery near your reception, consider getting champagne flute or bottle shaped cookies. Kids will love to eat them, and adults will enjoy beautiful frosting details that can be created on the cookies. Simply place in a small bag near guest's plates, or on a platter in the center of the table. As with any favor, make sure you include a wedding favor tag that thanks your guest for sharing in your special day. Place your favors in a small box or bag, and tie the tag onto the outside with ribbon for a nice presentation.